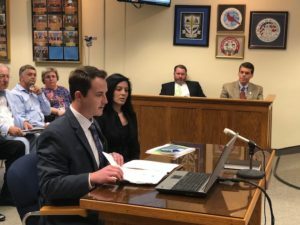 The Bladen County Board of Commissioners met on Monday night and learned about the Cape Fear Resource Conservation and Development, Inc. which specializes in natural resource conservation and economic development. Kyle Brewer and Danielle Darkangelo with Cape Fear Resource Conservation & Development. Kyle Brewer and Danielle Darkangelo both addressed the board of commissioners. Brewer, who is the Executive Director for Cape Fear Resource Conservation and Development Inc.(CFRCD), told the board the group’s mission is to conserve natural resources while encouraging sound economic development and community development through project funding and implementation in southeastern North Carolina. CFRCD is a non-profit organization that assists local governments and communities to carry out projects that will improve the quality of life, said Brewer. CFRCD has helped Maple Hill in Pender County with a sewer project and has helped Pender County with the construction of an Ag Center/Livestock facility. Brewer said the livestock facility can accommodate large numbers of animals and can host shows and outreach programs. Darkangelo spoke briefly about an affordable housing and revitalization project CFRCD is proposing for downtown Bladenboro. She also said the group is also working on aquatic activity in the Cape Fear River Basin. As part fo that, the group will focus on the Black River Basin with assessments of culverts in Bladen and Pender Counties. The goal of the project is to identify ways to decrease flooding, improve habitats and improve water flow. *The board conducted a public hearing regarding a rezoning request for tract located on Cromartie Road in Elizabethtown. The tract will be used for a commercial storage facility. *The approved the Letter of Engagement and the audit contact with Thompson, Price, Scott Adams & Company for $38,300. The board also approved a Letter of Engagement for an audit of the Local Government Employees RetirementSystem accounts. *The board adopted a resolution of support for the creation of a driver training facility to be located at the Law Enforcement Training facility at White Lake. *The Commissioners also voted to approve Memorandum of Understanding with the United States Marine Corps to conduct training exercises in July at the Law Enforcement Training Center at White Lake. *The board approved the Local Water Supply plans for East Bladen and West Bladen. *The board approved a Memorandum of Understanding with the Nc Department of Public Safety, Division of Emergency Management regarding the Bladen County DRA 17 Hazard Mitigation project.